Predictive Business Analytics, the practice of extracting information from existing data to determine patterns, relationships and future outcomes, is not new; it has been used in practice for many years. What is new, however is the massive amount of data, so-called Big Data, now available, that can better support decision making and improve planning & forecasting performance. Additionally, we now have access to technology that can store, process, and analyze large amounts of data. The analysis modules found in these tools have algorithms that can handle even the most complex of problems. Above all, there is a growing awareness among businesses, data scientists, and those with data responsibilities that there is a wealth of hidden information that should be tapped for better decision making. To make the most of Predictive Business Analytics, we need to prioritize what problems we’re trying to solve, which data and signals we should collect, where they are located, and how they can be retrieved and compiled. Once these steps have been taken, the data must be altered and cleansed in preparation for analysis with a predictive analytics software tool, which can be MS-Excel, an open source application, or the many other available applications in the marketplace. Predictive Analytics and finding solutions from Big Data have no boundaries. It’s applicable to nearly every industry and discipline. Ying Liu demonstrates how this is currently being used by the retail industry, as well as in education, healthcare, banking, and entertainment industries. Macy’s, for example, on a daily basis, checks the competitive prices of 10,000 articles to develop its counter price strategy. Other authors of this issue talk mostly about its application in the areas of Demand Planning and Forecasting. In contrast, Charles Chase illustrates how POS data can be used in sensing and shaping demand to improve sales and profits, while John Gallucci demonstrates how it can be used in managing new product launches. Gregory L. Schlegel discusses not only how Predictive Analytics can be used to optimize the supply chain, but also how it can manage risks. He talks about how credit card and insurance companies have reduced their overall risk by using predictive analytics. In addition, he provides case studies of companies in the CPG/Grocery, High-Tech, and Automobile industries that are using them to drastically improve their bottom line. He talks about how Volvo Car Corporation is targeting zero accidents and zero deaths/injuries by gaining insight from data downloaded each time their automobiles come to dealers for servicing. Using this data, Volvo wants to determine if there are defective parts that require correction, and/or if there are issues with driver behavior, all needing to be addressed. Eric Wilson and Mark Demers explain that with Predictive Analytics, businesses are looking to apply a more inductive analysis approach, not in lieu of but in addition to, a deductive analysis. In inductive analysis, we set hypotheses and theories, and then look for strong evidence of the truth. In other words, we search for what the data would tell us if they could talk. This is in contrast with deductive reasoning where we draw conclusions from the past. Allan Milliken outlines the processes that Demand Planners should follow to take full advantage of the power of Predictive Analytics. It can help to classify products that are forecastable and those that are not, enabling them to arrive at a consistent policy regarding which products should be built-to-order and which for built-to-stock. It can also flag exceptions, thereby enabling established corrective actions to be applied before it is too late. Larry Lapide demonstrates how Demand Planners can extract demand signals from the myriad of data gathered from various sources including a vast amount of electronic data drawn from the Internet. Mark Lawless discusses Predictive Analytics as a tool to peek into the mind of consumers to determine what types of products and services they are likely to purchase. It is true that Predictive Analytics is not revolutionary, but its applications can certainly be considered innovative. The significant impact it can have will continue to change the way businesses are managing demand, production, procurement, logistics, and more. There is an overwhelming belief that companies that can identify the right data and leverage it into actionable information are more likely to improve decisions, act in a timely manner, and have a true competitive advantage. 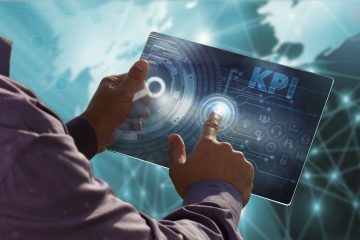 Advancing your organizations’ analytics capability can be the great difference maker between companies that are performing well, and those that are not. 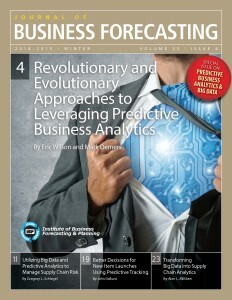 Your comments on this special issue on Predictive Business Analytics & Big Data are welcome. I look forward to hearing from you. The Journal of Business Forecasting (JBF) has been providing jargon-free articles on how to improve demand planning, forecasting, supply chain, and S&OP, step-by-step for over 30 years. A subscription to the JBF comes with IBF membership at no additional cost. Falling Asleep at Your S&OP Meeting?